Use a ruler to mark the center of the plane. Lay the ruler on the center mark, press down and fold the plate over the ruler. Glue one end from the fold up about 2 inches. Cut the other end at about a 45 degree angle from the fold and up about 2 inches and glue together to form the front of the boat. Cut away the extra plate 2 inches above the fold. Cut a 1 1/2" x 2" piece of foam plate and glue to the inside about halfway back from the front to hold the sides apart. Make a second hull the same way. Support the 2 boats at the front and rear by taping a piece of 2x3 inch cereal box cardboard to the vertical front and rear for temporary support. Cut the flat center part of the third plate and glue it to the top of the two boat hulls. Trim the excess plate and finish gluing. Remove the cardboard supports. Make the motor mount by gluing 2 curved pieces of the plate together and trim to 2 inches high and 2 inches wide as shown in the photo and glue to the aft center of the top. Make the propeller from a popsicle stick. Mark the exact center, 3/16 inch from a side and 2 1/4 inches from either and and drill a 5/64 inch hole. Hold the stick at the center and bend each side up about 30 degrees in opposite directions. 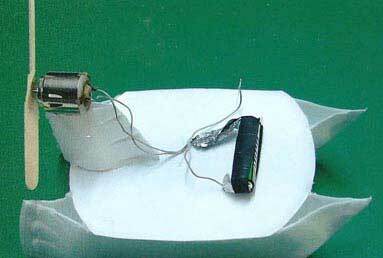 An electric motor can be found in a small remote control car. Pull the gear off and push the propeller on the shaft. Glue the motor to the top of the motor mount and extend the wires to the battery position on the front. Strip the insulation from an inch of wire and wrap aluminum foil around it. Stretch a wide rubber band or a piece of bicycle tube around the ends of an AA battery and put the foil wrapped wire under the band at one end of the battery. Put another piece of foil under the band at the other end of the battery leaving an end sticking out. Wrap the other wire end around a straight pin. When the pin is pushed into the foil end the motor should run. Remove the pin and stick it in the foam away from the foil for storage. If the boat moves backwards switch the battery ends. Steer the boat by bending either or both vertical aft pieces. The boat will run in an inch of water. Make a pool by laying a tarp over a low spot on the ground or over a wooden rectangle. The propeller can be made more efficient by rounding the leading edge and sharpening the trailing edge. Do not run on deep water or in windy conditions. Race your boat and try different angles on the propeller for more speed. Have fun and keep experimenting!